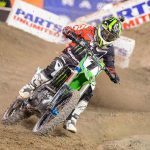 Ryan Villopoto captured his fifth-consecutive AMA Supercross win and sixth in seven rounds with a victory in the main event at Reliant Stadium in Houston, Texas. The Monster Energy Kawasaki rider passed holeshot-taker Mike Alessi on the opening lap and led the rest of the way for the win. Alessi, riding the Motoconcepts Racing Suzuki RM-Z450, remained in the hunt for the first few laps but soon gave way to a group including Team Honda Muscle Milk’s Trey Canard, Red Bull KTM‘s Ryan Dungey and Yoshimura Suzuki’s James Stewart. 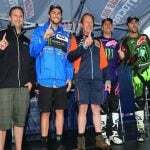 With Villopoto uncatcheable, it was up to that trio to provide the drama. 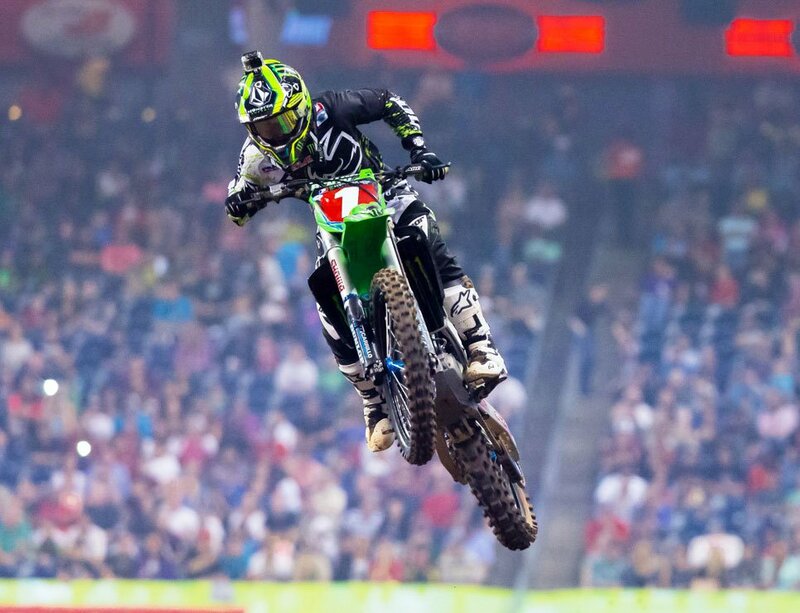 Canard sat in second for most of the first seven laps until a Dungey pass on Lap 7. A couple of laps later, Stewart made a challenge on Dungey but crashed in the attempt, damaging his front wheel. 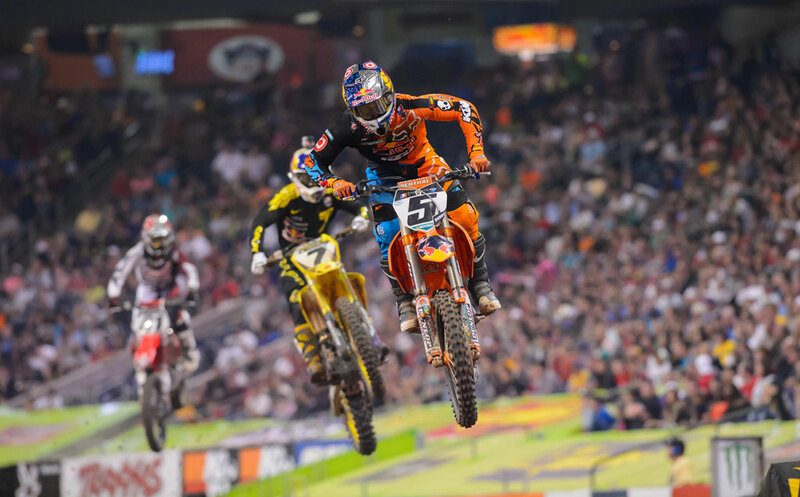 With Stewart out of the race, Dungey continued to finish 5.472 seconds behind Villopoto for second place. 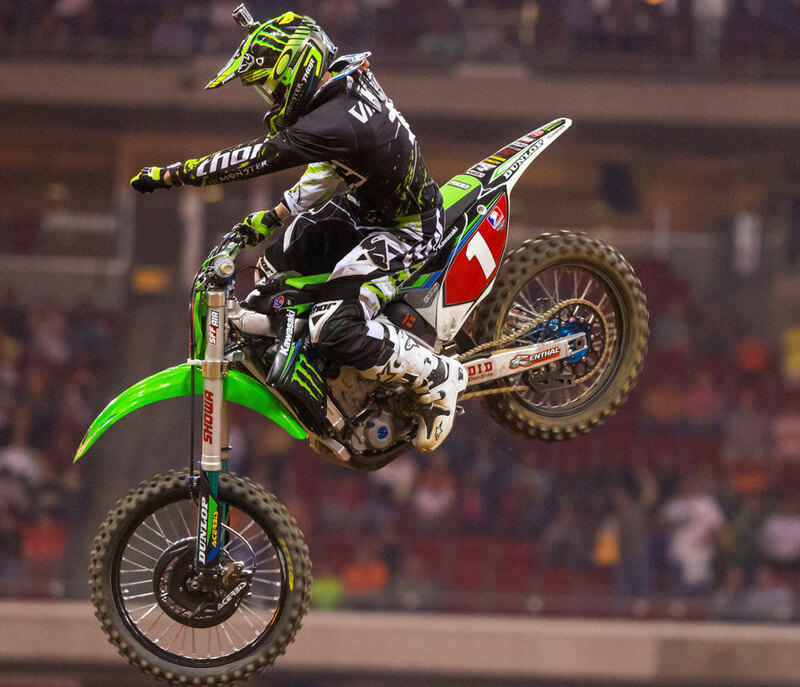 Canard crossed the finish nine seconds later to take third. Rockstar Suzuki’s Davi Millsaps had a lackluster start, sitting ninth after the first lap. He worked his way up the ranks but finished in fifth place but he’ll need to do better if he hopes to remain in title contention. 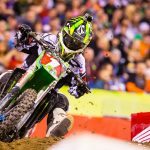 The fifth-place finish earned him 16 championship points but with Villopoto’s win, Millsaps saw his points deficit widen to 21 points from 12 points. Meanwhile, a string of podium finishes has put Dungey just four points back of Millsaps and 25 points behind Villopoto. With four rounds remaining, Villopoto is in full control, though both Millsaps and Dungey still have an outside chance. 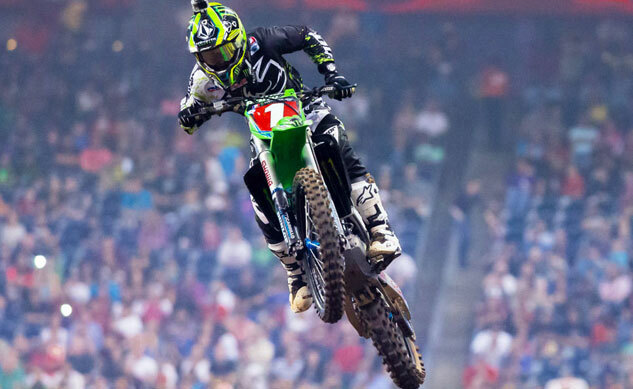 The 2013 AMA Supercross Championship continues April 13 at the Metrodome in Minneapolis.